TDmonthly Magazine Products by FISHER-PRICE INC. This platform works effortlessly with a DVD player, allowing a child to interact with the program using a colorful, wireless touch pad. -- It focuses on teaching memory, logical thinking and the value of numbers. -- It was nominated for the DIC Entertainment Ultimate TOY Awards. -- SpongeBob Squarepants is consistently ranked among the Top 10 Cable TV programs according to the Nielsen ratings. PowerTouch Library by Fisher Price helps children learn to read through electronic books, with new titles that include SpongeBob SquarePants, Jimmy Neutron, Fairly Odd Parents and the Berenstein Bears. In addition, there are new School Skills books that explore fun topics like Science, Dinosaurs, Reading , and Parts of Speech. Each Creatrix™ set includes a unique open-ended storybook and comes with easy-to-assemble play pieces. As parents and children read the story together, the vibrant colored Creatrix™ pieces can be used to build wild and wacky characters from the book. Or, children can use their imaginations to create new characters and stories to continue the adventures. The Starter Set comes with an eight-page storybook and ten pieces and a storage container shaped like a book that holds all of the pieces. Dora ?magically? grows or shortens her hair and sings while the lights on her crown twinkle. -- This is the number one top seller on both amazon.com dolls and toys categories. -- Dora has sold out at both Walmart.com and Toys ?R Us. -- One Mommies Group member says, ?My daughter is getting a Dora doll for Christmas. Everything Dora is exploding. . .? Expect this doll as well as all Dora products to trend up as this character grows in popularity and momentum well past the holiday season. This set features plenty of fun features like a working cannon, a toppling mast, figures and animals. --This toy is listed as a best-seller for both Amazon.com and Target.com. --Modular parts from the ship can be mixed and matched with other sets in the Imaginext system, adding to play value. --This set hones both building skills and imaginative play. Color Pixter is the answer to providing a world of artistic exploration in a small, portable panel. 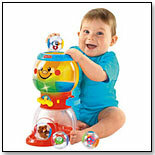 -- The toy appeals to a wide range of age groups, from preschool to elementary school. -- Create your own designs using pre-made images and backgrounds or 128 colors. -- It is a winner of the Oppenheim Toy Portfolio Platinum Award in 2005. This 14? Elmo doll comes with over 20 cool phrases, songs and games. What?s more, the doll is programmed with a personal greeting that includes the child?s name. Elmo comes cute as ever, wearing an Elmo T-Shirt and holding a puppy. Other versions include an Easter Elmo, Christmas Elmo and Birthday Elmo. With the popularity of the reality/talent show American Idol, it is no wonder that a do-it-at-home karaoke machine is available. The Star Station might not cultivate junior Whitney Houstons, but it’s sure to get kids off the couch and singing long into the night — a good thing. The station allows kids to sing, dance and view themselves on the television set. A child can even record the performance using a VCR — added incentive to adorn and self-adulate. The next generation of Pixter is here in the form of Pixter Multimedia. The hand-held entertainment system allows children to watch their favorite animated and live action shows on the Pixter screen. Plus, with 9 new video ROMS and more on the way, the sky is the limit in terms of entertainment possibilities. From T-ball to batting practice with a battery powered trainer, this Fisher-Price toy is designed to grow with the child. -- This toy is listed as a top seller on Amazon.com?s Sports and Outdoor Toys category in April, 2004. -- This product is designed to work three different ways, so beginners can hit off a tee and advanced players can hit machine-pitched balls. -- The 3-in-1 is a winner of the National Parenting Center?s Seal of Approval for 2004. This set includes a soccer ball and adjustable goal that responds as children score, encouraging them to continue playing and practicing. --The Super Sounds Soccer set grows with children as it is designed for beginners and pros, making it a toy that lasts. -- This item is so popular that is was sold out on Amazon.com as of April, 2005. Baby can learn A-B-Cs, 1-2-3's and parts of the body, plus sing along to 10 favorite songs and games. The dog bone collar lights up to the music. It teaches the alphabet, numbers, parts of the body and colors. It includes games for interactive fun. — “The whole Laugh & Learn line is great, but the Puppy is our best seller,” explained Diana Wells, owner of Well, Well, Wells in Portland, Ore.
— — As of 8.24.10, this product had 4.5 out of 5 stars from 100 reviews on Target.com and was listed in the top 30 best-selling toys and games. PROS: Interactive and entertaining. 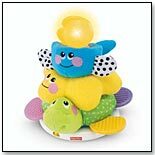 These soft, colorful, stackable ocean animals come in a variety of textures with multiple teething areas, and fit on a base that has flashing lights and plays two different songs. - This product was a top seller in the infant division on KBtoys.com in May 2005. - Target.com says this product, ?encourages the development of motor skills, stimulates senses, and enhances learning through discovery.? - This product received an average ?outstanding? rating from reviewers on epinions.com. One of the most popular ?Sesame Street? characters, Elmo has been dancing his way into people?s hearts for years with no sign of stopping. - Elmo does it again as the Hokey Pokey version maintained its top seller status on Amazon.com?s Stuffed Animals division in May 2005. - Hokey Pokey Elmo won the 2003 T.O.T.Y. (Toy Of The Year) award from the Toy Industry Association. - This item has been so popular it has inspired a miniaturized line of hokey pokey characters to be released this spring, which is sure to increase interest in the original. Peek and Play Eeyore is designed to grow with baby and plays seven different interactive games. - Pooh?s pal hit top seller status in the plush toys division of WalMart.com in May 2005. - Eeyore is sound activated and will respond to a little one?s voice or claps. It also comes with a butterfly rattle that functions as a remote control. - The NYTimes gave a new movie featuring Eeyore, ?Winnie the Pooh: Three Cheers for Eeyore and Rabbit,? rave reviews, possibly signifying an upturn in popularity for this character. This interactive Elmo says silly things to child-doctors as they examine his boo-boos, listen to his heart, take his temperature and help him blow his nose. - This new version of Elmo has already hit the top seller list on WalMart.com in May 2005. 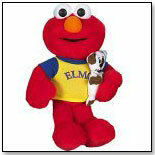 - According to About.com this Elmo encourages nurturing play and can help turn doctor visits into positive experiences. - This toy comes with a stethoscope, thermometer, a hankie, a Band-Aid and a soft book about going to the doctor. After drinking from his sippy cup Elmo asks to go potty. He even has accidents and reassures children that sometimes these things happen. - Elmo was resting at the top of KBToys.com?s top seller list in May 2005. 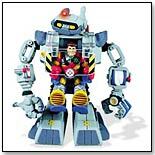 - In 2004 this item received NBC?s Ultimate Toy of the Year Award and the Oppenheim Platinum Award. - Elmo comes with his own book, sippy cup, training pants and potty. Dressed in his cowboy duds, this Tigger will sing a silly song when his hand is pressed and says several different phrases. 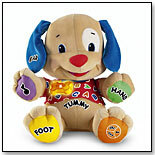 -This toy bounced its way to top seller status on KBToys.com?s Animals and Stuffed Toys category in May of 2005. - This is a brand new item, just released for spring and is sure to catch consumers? eyes. - After more than 70 years, the gang from 100 Acre Woods are still drawing a crowd as a stage production has just hit the circuit in England to rave reviews. Pooh is learning to walk. When called, he approaches at different speeds, and talks as he?s practicing his steps. - Love to Walk Baby Pooh received a 2004 iParenting Media Award and was featured on the Today Show, where he received the Toy Test Toddler Segment Award in 2004. - Pooh was a top selling stuffed animal on eToys.com in May 2005. - This voice-activated Pooh will turn toward the caller when he hears his name. The Rescue Heroes can get on the job even faster with a remote-control robot that works with all the figures in the line. The robot can even identify which character is in the cockpit.
? This toy was a top selling item for girls on eToys.com in June 2005.
? It measures approximately 17" x 10" x 12" and features a posable and retractable right arm. This three-panel Play Wall encourages and rewards babies? physical activity, from sitting and crawling to standing and cruising. The Play Wall can be configured in a zig-zag or U-shape. Plus, each of the panels has crawl-through openings and is full of activities, such as a hanging inflatable ball to bat at, fabric ?curtains? to play peek-a-boo and ?wiggly-jiggly? tubes to crawl through. By playing with the different activities, baby can activate three dancing lights and one of 10 songs and eight sound effects. Five attachable toyscan be placed in 11 different locations to mix and match the play at the appropriate height for baby. The toy requires 3 AA batteries, not included. This play center includes eight blocks and has five sides filled with activities. Babies are challenged to identify what is in each block by using hints, descriptions and sounds.